Who Are the New Guardians of the Galaxy? Find out this January from Donny Cates and Geoff Shaw with a cover by David Marquez! The burning question for fans of the Guardians of the Galaxy may be close to being answered: Who will be the new members of the cosmic group? Last week at New York Comic Con 2018, writer Donny Cates announced that the first member of the Guardians in his upcoming GUARDIANS OF THE GALAXY series with artist Geoff Shaw would be Cosmic Ghost Rider. Marvel fans have seen reveals on social media, shedding light on more characters who may join the team. 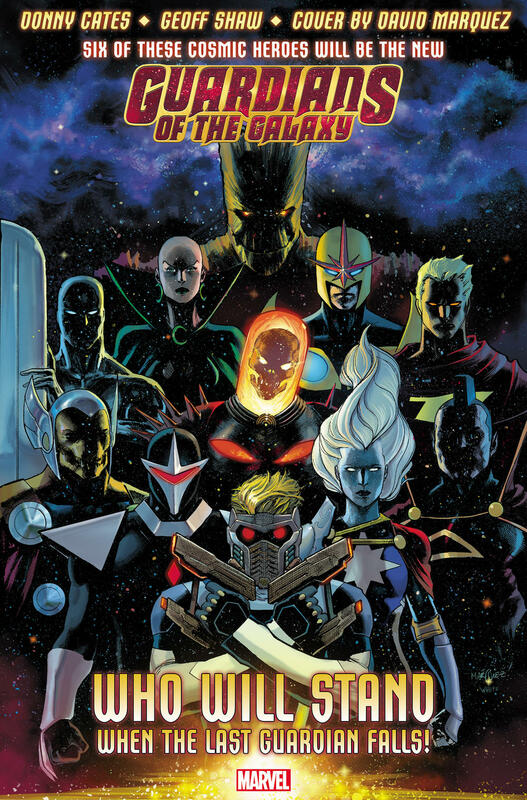 The newly released piece of art by David Marquez has several familiar faces on it, including Star-Lord, Groot and Silver Surfer. While Cosmic Ghost Rider has been confirmed, that still leaves five more seats to fill -- and there are ten characters surrounding the flaming Frank Castle. Stay tuned to Marvel.com to find out!